Year after year, volunteer crews join forces to cleanup coastal waterways. But those efforts can feel meaningless as stormwater carries fresh litter into previously cleared channels. PEP Member Don Bates, Vice President of Operations at Thompson Engineering, had an idea to tackle the problem of stormwater-borne trash and make cleanup efforts more lasting. He designed a low-cost device called the Litter Gitter to intercept trash as it flows through waterways. When a section of Three Mile Creek was slated to become a nature trail, Bates found a perfect opportunity to test his device. After surveying the area by canoe, his team identified one of Mobile County’s most impacted streams, the Maple Street Tributary, as an ideal location to evaluate the device. 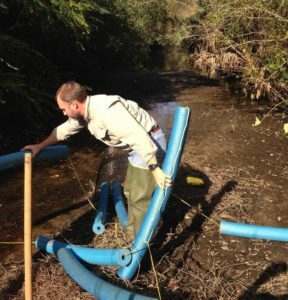 Following a cleanup event involving PEP members and Mobile Bay National Estuary Program (MBNEP) partners, Bates installed the first prototype of the Litter Gitter along the Maple Street Tributary. Bates launched a new company, Osprey Initiative, LLC, to produce the Litter Gitter and oversee and maintain traps which are checked weekly. The Litter Gitter is a basket-style device moored to the bank via floating booms. The device has proven successful, removing 266 pounds (143 cubic feet) of litter from Maple Street in the eleven months since installation. Osprey recycles everything they can when emptying traps. So far, over 70 pounds (60 cubic feet) of litter has been recycled from the Maple Street trap. With the success of the Maple Street prototype, PEP and MBNEP joined forces with Bates in funding three additional test sites to prove the Litter Gitter’s effectiveness. The City of Mobile approved locations for installation, two in Three Mile Creek in Mobile and one on the Dog River in Prichard. With several major storms moving through the greater Mobile area during the pilot study, Bates’ team had plenty of opportunity to evaluate Litter Gitter performance under variable conditions. Hurricane Harvey brought water flow exceeding the engineering capabilities of the prototype, allowing Bates to identify stress points and make modifications to the device. As a result, he has developed a high-velocity prototype that incorporates a planning device, allowing the Litter Gitter to ride atop the waves during high flow events. Information collected from the pilot study has allowed Osprey Initiatives to tailor the Litter Gitter to a diversity of water systems, from slow-moving streams and estuaries to high-flow tributaries and storm-impacted waterways. Osprey currently has a patent pending for the device. The Litter Gitter’s success is taking off. Mobile Bay National Estuary Program has secured funding to install even more devices in the watershed through a grant from the Environmental Protection Agency’s Gulf of Mexico Program. The first phase of the two-year grant includes installation of Litter Gitters in ten strategic locations throughout the Three Mile Creek watershed with the goal of reducing stormwater-borne litter by 4,800 pounds. Today, the Maple Street Tributary serves as a showcase for the potential impact of small stream litter collection and proves efficient litter management can be affordable. PEP encourages more members and businesses to get involved and is committed to continuing to explore solutions for Creating a Clean Water Future alongside our partners.